While Jason Bay more than held his own in his Boston debut, Manny mania continues to sweep Los Angeles and there’s no shortage of commentary on the former Sox slugger that took Chavez Ravine by storm over the weekend. Ramirez drove in his first run Sunday in the first inning, his single to left scoring Matt Kemp. He doubled to score Russell Martin to cap a three-run second inning that put the Dodgers ahead, 5-2. Ramirez homered in the fifth and Kemp, who was three for five, hit his 13th home run of the season in the eighth inning. As you know, Joe Torre asked Manny Ramirez to cut his hair, but I have this hunch it will never happen. Torre disagrees, so now one of us will be making a charitable donation. If Ramirez returns to Dodger Stadium a week from today to open the team’s next home stand with all his hair, Torre said he would make a donation to Mattel Children’s Hospital at UCLA. As part of the deal, Torre agrees he will say nothing more to Ramirez about his hair, believing Ramirez heard him the first time they talked. If Ramirez shows up to Dodger Stadium without the dreads, Page 2 will make a donation to the Joe Torre Safe at Home Foundation. As part of the deal, of course, I will say nothing more to Ramirez about his hair. But just between you and me, who is Torre kidding? You think he’s going to bench Ramirez because the guy doesn’t get his hair cut? You think if he fines him it will make a difference, Ramirez knowing he’s not getting paid by the Dodgers, so there’s no money to take out of his pay? You think the Red Sox are going to take it out of his pay, and do a favor for the former Yankees manager? 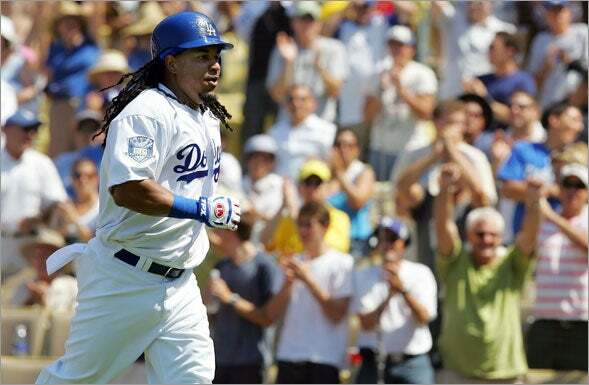 The Dodgers’ trade for Manny Ramirez last week forced Pierre to change positions. Again. And the fleet-footed leadoff hitter is facing the threat of being sent to the bench. Again. Look, Selig should already have summoned Ramirez after he boorishly pushed the Red Sox’s long-time traveling secretary Jack McCormick to the ground on June 29 in Houston because the 64-year-old was unsure he could get Ramirez 16 free tickets for that day’s game. McCormick is every bit the employee of Major League Baseball as a batter that would be protected by the Commissioner’s Office if a pitcher threw a ball purposely at his head. Selig should have suspended Manny then. Indulging or ignoring this kind of act for years – by the Red Sox and the Commissioner’s Office – is why Ramirez has been emboldened to keep behaving in a fashion detrimental to baseball. It is the delegation of “veterans” who came to Epstein declaring, in essence, “We cannot work in this ambience!” (then perhaps huffing off to their trailers for a massage and some chamomile tea) that’s the most bizarre element of the whole affair. For all the murmurings from the fainting couch by the local baseball romantics about how Manny Ramirez failed to respect The Game and did his teammates dirt, these same people seem more than willing to accept the proposition that the rest of your defending World Champions are made of candy glass. Is the poisonous presence of Manny Ramirez the reason catcher Jason Varitek is petrifying almost by the hour, or why Josh Beckett hasn’t thrown a changeup in six weeks, or why most of The Kids have been playing like people who got lost on the way to the AAA park? (Jacoby Ellsbury, the speedy young center fielder who was such a sensation in last year’s World Series, is hitting an abysmal .186 since the All-Star break and has stolen one base since June 17.) And has Epstein himself been so distracted by Ramirez’s performance that he’s failed to notice that his middle relief corps is a landfill? As near as anyone can tell, as the Rays and the Yankees both strengthened themselves for the final weeks of the season, the only thing the Red Sox front office worked on in the days prior to the trading deadline was finding a way to ship Manny Ramirez and his 20 home runs out of town. Manny Ramirez: Another outing that demonstrates exactly why the front office made him a So Cal resident. “His game is exciting, man,” gushed Kemp. “Having him on our team is crazy.” That electricity and enthusiasm felt by his teammates, manager and new fans was matched by Ramirez’s production, highlighted by including his second appearance with a bash, this one into the left field seats. #512 on a career, which puts him in a 20th place tie with Ernie Banks and Eddie Matthews. They’ve also got the audio from Manny’s postgame interview yesterday. And you can just tell by reading the body language of the other players that they are also engergized and it looks like they are having fun too! !…maybe Manny is reminding these guys that baseball is a pretty simple game, you see the ball and hit the ball, so have fun playing ball! Manny Ramirez said he didn’t want to be treated any differently than any of his teammates at his introductory news conference as a Dodger. So, Ramirez agreed to cut his signature locks, though he has yet to do it. Torre isn’t worried about that yet but expects him to take care of it in the near future. As for music, Ramirez set up a music player in his locker, and he’s also been listening to his iPod. Torre’s theory on music is that if everyone can handle it, he doesn’t mind loud music permeating the clubhouse. We gave the Dodgers Nomah. We gave them Derek “Hello, I’m Brian Daubach of the Boston Red Sox” Lowe, and, last but surely not least, we gave them Manny. In Boston, we wrinkled our noses when Nomar Garciaparra, whom we had loved for years, went south on us and wouldn’t match Jeter in intensity. We didn’t know what to do about Lowe acting goofy on the road. And, finally, what’s up with Manny? It’s a very nice touch, and clearly the work of Dr. Charles Steinberg, the former Red Sox impresario who followed McCourt out to L.A., that the Dodgers gave Manny the number 99. It’s not every ballplayer who gets his IQ on his jersey. Don’t cry for Nomah, Derek, or Manny. They have found their level. WBZTV.com takes a look back at Manny’s time in Boston this morning, and has clips of all the Ramirez sound bites through the years. The Inside Track has Jacoby Ellsbury checking out Manny’s penthouse at the Ritz. On Boston talk radio station WRKO last Friday, Sox owner Tom Werner was asked about the chances of the Sox signing Manny as a free agent this upcoming winter. “What are the chances that Mitt Romney will be President,” Werner replied. For more of Manny in LA, check out Sunday’s roundup, which includes the Dodger slugger’s comments this weekend on finishing his career in Los Angeles after finding peace upon arrival, his difficulties playing in Boston, the possibility of appearing in Spanish soap operas, Dodger fans, and more along with Manny’s agent Scott Boras refuting a Globe report that Ramirez lobbied to remain in Boston after learning he had been traded to the Dodgers.